Paper jams are a frustrating part of using a printer. Not only does it waste paper, it could waste perfectly good ink or toner. Fortunately, there are only a few common causes of paper jams and multiple possible fixes that most anyone will be able to perform. Before going into detail about how to clear a jam from your printer, it is essential that you understand the importance of preventative paper care. Wrinkled or damaged paper can cause repeated jams. Also, be sure you are loading the paper straight, using the guides on the side of the tray to properly align the paper. If the rollers pull the paper in crooked, it can cause a jam or the finished document will be lop-sided. If you can see the jammed paper, firmly but gently attempt to pull it out of the machine. If you pull too hard, it could tear, which could hinder future jobs. If the paper is jammed inside the machine, turn the power off and remove the tray(s). Check the LCD display. In many newer models, an error message will be shown that tells you specifically where the jam is. Open the access doors to the paper path as well as the cartridges. If necessary, you may have to remove the cartridges to reach the jam. 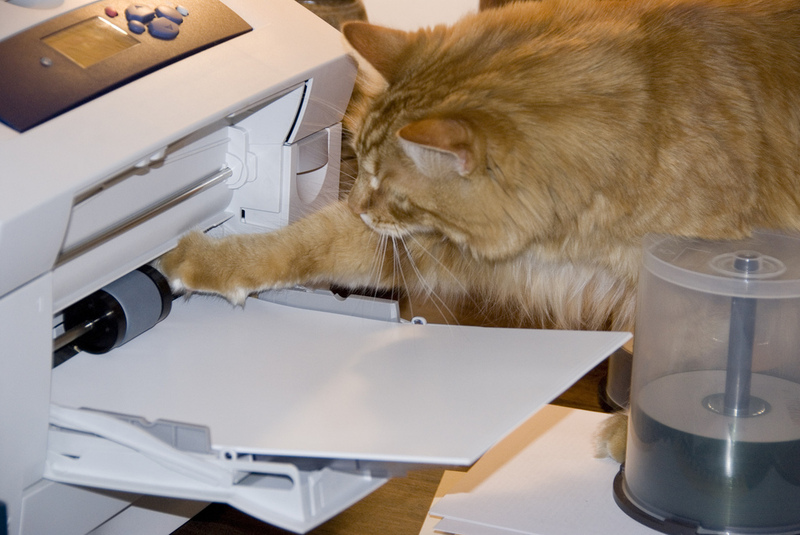 Just be sure you set the cartridges on a towel or newspaper in case ink or toner leaks out. Once you locate the jam, firmly grasp the piece of paper with both hands and pull firmly. Try to avoid tearing the paper. For jams with multiple pieces of paper, try removing the middle page to loosen the jam. If you do happen to tear the paper, you can try manually rotating the rollers to get the small pieces out. If this doesn’t work or is not applicable, you can always try using a set of tweezers to grab the torn pieces of paper. Once you feel the jam is cleared, insert the cartridges (if applicable) and close all open panels. Turn the machine back on and print a test page. If the error message remains, there is either still paper jammed inside the printer, or something is setting off the sensor, which can be fixed by cleaning the machine. If you have tried fixing the jam yourself without success, it is possible that there is a part inside the printer that is no longer serving its purpose. 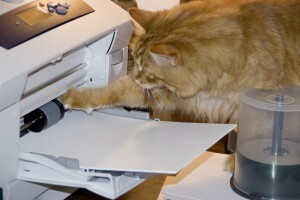 You may want to contact technical support for more detailed troubleshooting tips or take your printer in for repair.